Memo to the file : For several years it has been apparent that the F.P.E. 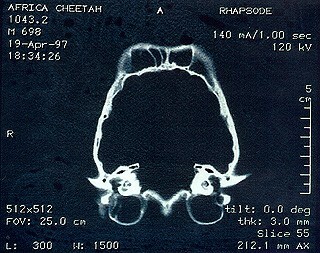 lesions in the cheetah are related to an “arch length discrepancy” problem – that is a dis-harmony between the length of , or mass of alveolar bone available to support the individuals dentition, . . . and . . . the total mass of dentition or total length of all of the teeth. The question has remained ” how to identify the cause of the problem “? Clearly, it was necessary to look at, evaluate and compare a variety of cheetah skulls. This is more easily said than done, because of the C.I.T.E.S. restrictions on the importation of endangered species or their “body parts”. It has therefore taken a number of years to manage to gather a representative sample of cheetah cranial material together, and to conduct a reproducible analysis. The material presented here represents the results of such an analysis. This material was presented at the 1997 meeting of the American Association of Zoo Veterinarians – poster session. The material is presently under analysis and will soon be assembled in the form of a formal paper for publication. The color frames boarding the various sections are the 3-D color reconstructions of the individual CT-Scan radiographs. The “white” portion of each image represents the x-ray portion of that numbered “slice”. 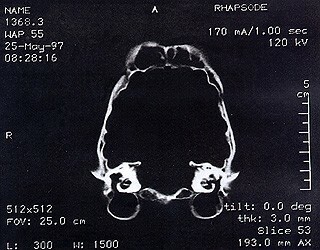 Figures 1 and 2 are but two of the original CT-Scan radiographs from which the 3D images were reconstructed.